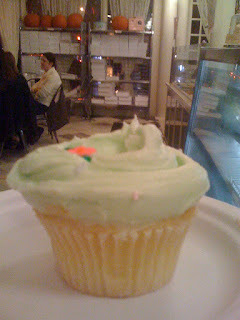 Since it's still my birthday weekend (yep, milking it for all it's worth), tonight I stopped at Magnolia Bakery on the way home from babysitting to purchase a happy birthday to myself vanilla cupcake. After I scarfed my tasty treat, I walked from the bakery on the Upper West Side all the way home to Hell's Kitchen. I didn't notice until I was in my apartment that I had frosting all over my nose. Cupcake fail.